**UPDATED 5:47 AM= Snow started to fall across the region at about 4:00 this morning. The Winter Weather Advisory is still in effect, but has been extended to 10:00 this morning. Expect anywhere from 1-3″ of snow with lesser amounts near the water. The switchover to rain will still happen, but it will be a bit slower than first anticipated, so prepare accordingly. Be safe and warm out there! 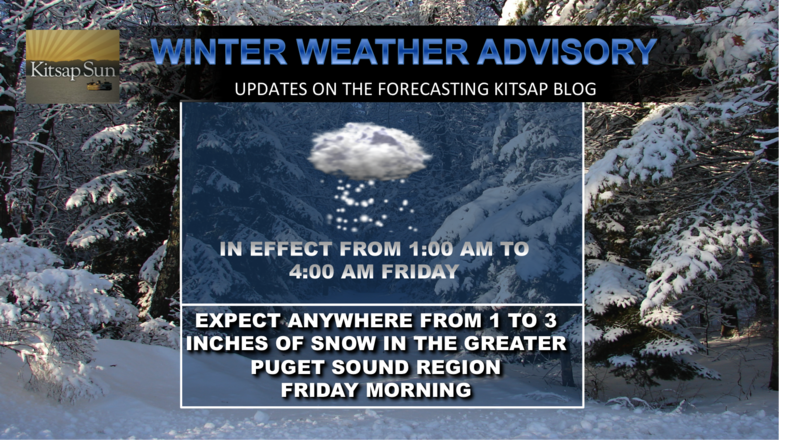 The forecast over the next 12 hours will be incredibly complicated, but there’s a general consensus that, at least for us on the Kitsap Peninsula, this will be a very weak snow event. Temperatures will be just barely cold enough to support snow, so even a little warming could be the difference between all snow or all rain. See how complicated snow forecasts can get around here?! The NWS is calling for anywhere from 0-2″ over the Hood Canal/Kitsap region, so definitely plan on getting up a little earlier than usual just to take a look at road conditions. At this point, all of you have about an equal chance of waking up to green lawns as you do white ones. Indeed, this is one of those scenarios where no particular place on the peninsula is favored to receive more snow than another. One thing is for sure though: Rain will dominate by the afternoon for much of the lowlands. Again, we’ll be shadowed, so the rain won’t be a huge deal for us. Christmas looks dry and chilly right now, so at least we’ll have one ingredient in our favor for making this place feel a little more festive 🙂 Have a great evening! 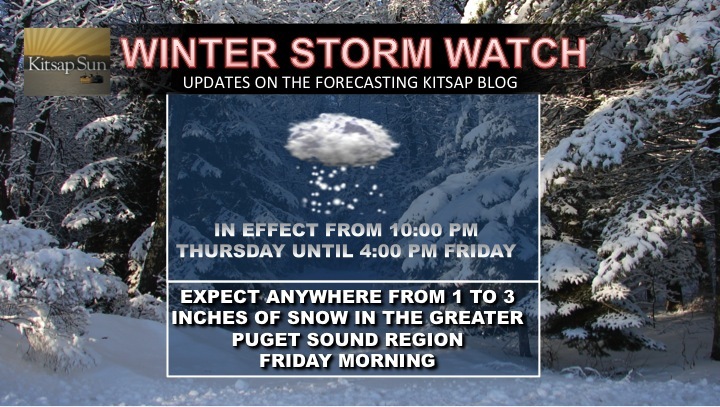 The Seattle National Weather Service has issued a WINTER STORM WATCH, in effect from 10:00 PM Thursday evening until 4:00 PM Friday afternoon, for anywhere from 1-3 inches of snow in the greater Puget Sound Region. This is a complicated forecast (as any snow-related forecast is), primarily because we are going to engage in a cold vs. warm battle that will ultimately determine how much snow we see. First off, I personally don’t believe we’ll see that much snow with this system as temperatures will be pretty marginal and the Kitsap area won’t be favored to see much of the white stuff anyway. That being said, some snow is possible. This particular model suggests far eastern Kitsap County could see around three inches of snow, with most everyone else forecast to receive 1-2 inches. So here’s the story: The passage of a chilly cold front Wednesday night (tonight) will usher in some much cooler air during the day Thursday. High temperatures likely won’t crack 40. As the sun sets Thursday evening, temperatures will plummet. But here’s where it gets complicated. An advancing warm front will begin charging into Western Washington early Friday morning, bringing with it precipitation and warmer air. Will we have enough cold air stored by the time the precipitation arrives? Believe it or not, it’s still too soon to tell. Right now the precip is set to arrive by 4 AM Friday morning, which is just about perfect for those wanting snow. By that time, temps will still be in the lower 30s. The next forecast problem is how soon we warm up. Chances are it could be very quick, bringing us into the mid-30s by sunrise. Other models suggest we could stay cool enough for snow through the late morning hours, with snow continuing for north sound folks into the afternoon. Stay tuned for updates as they come in. Sometimes models overdo snow totals and a lot of people get disappointed, so we’ll see what models are saying tonight into tomorrow. Really though, do we ever expect snow to last long on the peninsula? Many of us just ask for a few flakes…if not a few inches. This go around, we may actually get our wish. For those who despise the snow, you don’t need to fear at this point. This will be a relatively mild system, so whatever snow does fall will likely stay off the roads. Watch the Kitsap Webcast below for more info! Going into this cold event, there were several years that popped up as potential analogs, including 2008 and 1990. 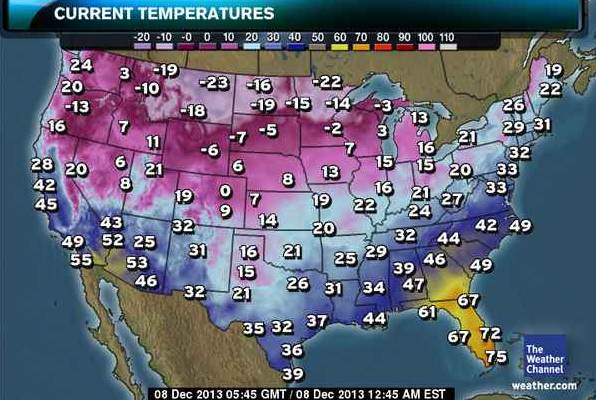 Seriously though, this cold is intense, from the 20s in Sacramento to near freezing temperatures in Arkansas. 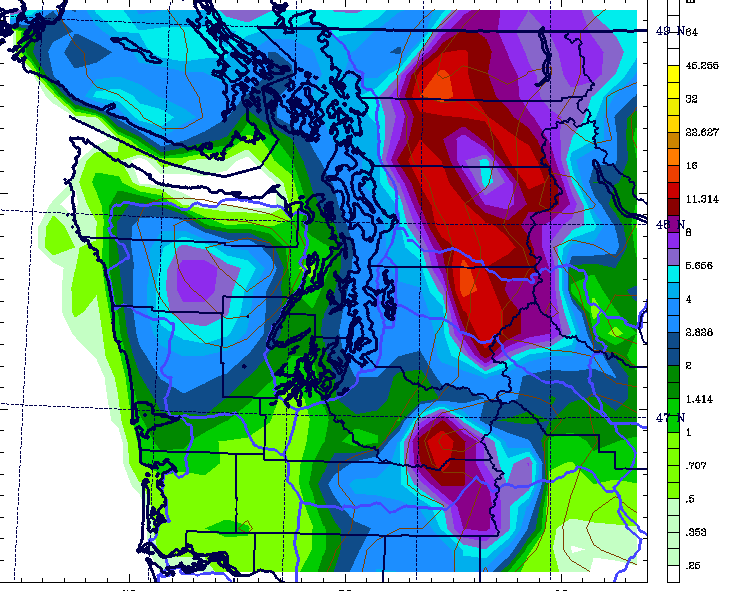 So what does Kitsap have in store for the next week? Actually very seasonable weather down the line, but we have to work through the transition process of scouring out snow before we get there. Tonight will be another night of lows in the low teens, so be sure to insulate those pipes and bring in the pets! The general story Monday into Tuesday will be mostly cloudy skies with light snow/freezing rain showers with highs in the low to mid 30. The Olympics will shadow us from the brunt of this system, but some light snowflakes are not out of the question. We’re back to the rain and wind by the end of the week. Long range models are hinting at perhaps another shot of chilly winter weather closer to Christmas, so I’ll definitely keep an eye on that one. There are still a lot of questions left unanswered in the weather models regarding our next likely snow chance, but one thing is certain–it’s going to get very cold around here!